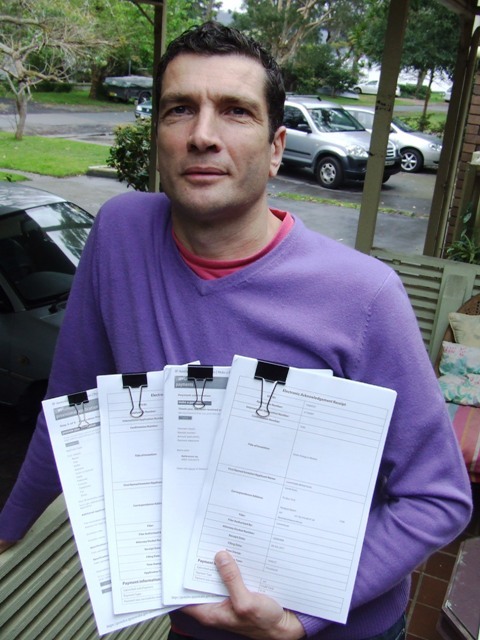 Picture of Lionel Kools holding his US and AUS Patent application Acknowledgement Receipts. Palm Beach, Australia (MMD Newswire) August 17, 2011 - - An Australian architect turned product developer, invented the ultimate green electric vehicle technology. The device is designed to charge electric powered vehicles as you drive. There is no need to recharge the electric vehicle batteries at the end of your driving cycle as they are continuously topped to their full capacity while in motion. No grid, no plug, no waiting. You can drive until you drop. The principle is to convert kinetic energy from a vehicle in motion into electrical power without affecting the vehicle's performance and/or its energy consumption. This affordable, scalable and highly flexible technology has tremendous potential and is not only limited to the electric car industry. The range of applications can vary from a single electric operated pocket bike to a worldwide conversion of existing electric and non-electric operated transportation infrastructure network into green renewable energy power plants. "Recharge As You Drive" Technology! To date, I have developed 2 products: “Green Energy in Motion” and “888-SuperPower”. Both products are 100% developed in Australia. As you are aware, the world population is expending dramatically and our natural resources will be not necessary able to sustain this growth without additional support. The “green energy in motion” and/or the “888-superpower” technology aims are not to compete with the petrol, the gas, the coal mining and the nuclear industries. Our aim is to offer additional solutions to utilize these natural resources in a more efficient manners and consequently to reduce the level of CO2 produced worldwide. “50/50 by 2020” is achievable and someone - at some stage – needs to lead the way. Why not! Australia. The “Green Energy in Motion” device was developed as a “one fits all” solution to fit into the current Electric Vehicle component industry (AC/DC converter, electric motor,..). The “888-SuperPower” was developed under a different design approach: To design a simple, affordable and flexible solution able to accommodate specific end user power output requirements. •To produce an efficient, reliable and cost effective device (production and maintenance) – also accessible to the developing countries. Our products and technologies is the next logical step for the hybrid and electric powered vehicle industry: To be self-rechargeable as you drive! As a part of our technology flexibility, all non electric operated vehicles can be converted into green energy plant on wheels without changing or modifying their type of engine, transmission or propulsion.